Do you love watching crime investigation shows like CSI, NCIS, Law and Order, and Criminal Minds? Have you ever imagined yourself solving crimes through careful analysis and critical thinking? Do you have excellent attention to detail, a firm sense of justice, and a strong stomach? If so, Buffalo State College’s Forensic Chemistry Program might be perfect for you. In the past few years, TV shows like those we listed above have given forensic chemistry a big image upgrade. As a result, colleges and universities like ours have seen forensic chemistry grow rapidly into one of the most popular majors. However, it’s important to be aware that real forensics teams deal with far less homicide than those on TV. Since the vast majority of deaths are a result of natural causes, it is unlikely you will be solving murders every day of your career. In addition, very few forensic specialists interrogate suspects, set up sting operations, or make arrests—although there’s nothing stopping you from whipping off your sunglasses and delivering a cool line once in a while. Read on to learn more about our forensic chemistry program. 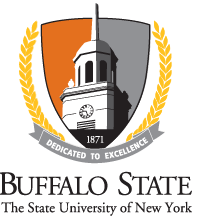 Since 1971, Buffalo State’s bachelor of science degree in forensic chemistry has provided a high-quality and well-rounded experience for its students. Our program offers rigorous training in the theories and practical aspects of chemistry with a focus on analytical techniques. The classwork contributes to the development of both the practical aspects of forensic practice, as well as the training of future forensic practitioners. This program also meets the requirements for certification by the American Chemical Society and fully prepares students to enter a professional career not only in forensic science, but also in analytical chemistry. We prepare each student individually for the rigors of forensic analyses, research, and legal mandates. In today’s world, textbooks are only a part of the information that can be used to enhance one’s knowledge. Students in this program also need to be open-minded, ethical, adaptable, and able to develop critical thinking skills to ensure success in the continually evolving field of forensic chemistry. Academic rigor: Our program includes a high-quality and comprehensive curriculum in which students can acquire the knowledge, skills, and experiences necessary for success from faculty with plenty of field experience. Hands-on experience: Courses within the forensic chemistry major integrate chemistry, biology, physics, and mathematics with research and hands-on experience. State-of-the-art facilities: The renovated Science and Mathematics Complex includes a 96,000-square-foot addition with state-of-the-art laboratories and classrooms chemistry majors use. Small class size: Forensic chemistry classes average 10 to 15 students, so that each student receives highly personalized attention. Research opportunities: Undergraduates have the unique opportunity to gain knowledge and useful experience by undertaking research with faculty and staff. Scholarship opportunities: We offer scholarships specifically for chemistry and forensic chemistry majors, including the Millacci-Brock Scholarship. Many other scholarships opportunities through the college are available as well. Phi Lambda Upsilon: This is a national honor society for all chemistry students. Admission is based on specified criteria of academic achievement. Iota Sigma Pi: This is a national honor society for women in chemistry. Undergraduate and graduate chemistry students who meet specified criteria of academic achievement are eligible for membership. Professional Organizations: Our department is professionally affiliated with The American Academy of Forensic Sciences, the American Chemical Society, the National Academy of Sciences, the Royal Society of Chemistry, and World Science. Chemistry/Forensics Club: This club, open to all students with an interest in forensic chemistry, holds chemistry-related activities both on and off-campus throughout the year. Criminal Justice Club (CRJ Club): The purpose of the Criminal Justice Club is to build unity among members and to educate all Buffalo State students on concerns of crime and safety. While most student internships occur in forensic laboratories in New York State, we have had students intern in Washington D.C., Philadelphia, and Ontario, Canada. Analytical Chemistry and Instrumental courses are required, so the student may make an appointment with the instructor any time after their junior year and when they are on their way to fulfilling the prerequisites. Unlike many other science programs, forensic chemistry is quite specialized. About 90 percent of forensic chemists graduates work in laboratories associated with a federal, state, or local police departments; medical examiner's offices and morgues; government agencies such as the FBI; public and private universities; hospitals; quality control testing laboratories; or law firms. There is also a growing number of private labs that carry out forensic analyses. According to the survey of the American Academy for Forensic Sciences (AAFS), more than 10,000 job opportunities in the field of forensic science are expected over the next decade to address an expanding case backlog.